The Castrato is a nuanced exploration of why innumerable boys were castrated for singing between the mid-sixteenth and late-nineteenth centuries. It shows that the entire foundation of Western classical singing, culminating in bel canto, was birthed from an unlikely and historically unique set of desires, public and private, aesthetic, economic, and political. 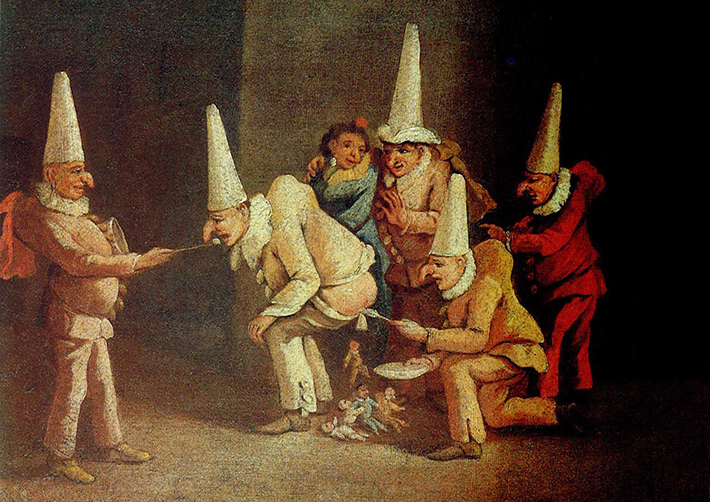 In Italy, castration for singing was understood through the lens of Catholic blood sacrifice as expressed in idioms of offering and renunciation and, paradoxically, in satire, verbal abuse, and even the symbolism of the castrato’s comic cousin Pulcinella. Sacrifice in turn was inseparable from the system of patriarchy—involving teachers, patrons, colleagues, and relatives—whereby castrated males were produced not as nonmen, as often thought nowadays, but as idealized males. 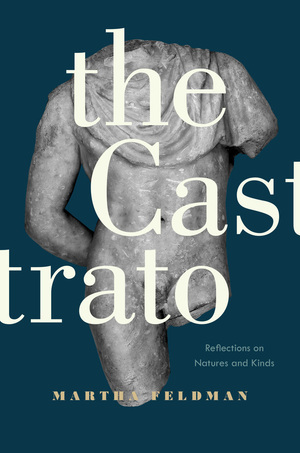 Yet what captivated audiences and composers—from Cavalli and Pergolesi to Handel, Mozart, and Rossini—were the extraordinary capacities of castrato voices, a phenomenon ultimately unsettled by Enlightenment morality. Although the castrati failed to survive, their musicality and vocality have persisted long past their literal demise. Martha Feldman is Mabel Greene Myers Professor of Music, Romance Languages, and Literatures and the Humanities at the University of Chicago. She is the author of City Culture and the Madrigal at Venice and Opera and Sovereignty: Transforming Myths in Eighteenth-Century Italy and coeditor of The Courtesan’s Arts. 6. Vocal folds in slow motion, from UCDavis Health System, The Voice and Swallowing Center. 7. View of laryngeal cartilages from Acland's DVD Atlas of Human Anatomy by Robert D. Acland, 6 vols. (Philadelphia: Lippincott Williams Wilkins, 2004), vol. 4, "The Head and Neck, Part 1." 8. Strobe made by ENTs Dr. Daniel Martin and Dr. Jacquelynne Corey at the University of Chicago Medical Center, with tenor Harold Olivey singing in falsetto. Note that the vocal folds do not make full body contact. 13. Consonant M sung during an MRI. From Robert Caldwell and Joan Wall, The Singer's Voice: Complete Set, 5 DVDs (Redmond, WA: Caldwell Publishing, 1991-93), disc 3. Video from an MRI taken of a soprano who sings the letter M with a visibly lowered palate. The singer's mouth is closed so the air fails to escape from her mouth, instead exiting from her nose. 16. Beniamino Gigli, the golden-voiced tenor who reigned supreme at the Metropolitan in the 1920s, compares a free-floating glottis with a lowered, stiff one at a singing lesson for a German student. From the 1936 film Du bist mein Gluck. Filmed in 35mm, the picture was directed by Karl Heinz Martin, written by Lotte Neumann and Walter Wassermann, and produced by Bavarian Film, with sound mix by Tobis-Klangfilm. This video can be viewed on YouTube at http://www.youtube.com/watch?v=Fya2BCu7WWg. 19. Excerpt of Maria Callas singing Rossini's "Una voce poco fa" from Il barbiere di Siviglia the live Paris concert at the Palais Garnier (Théâtre National de l'Opéra), 19 December 1958, with the Orchestre et Choeurs du Théâtre National de l'Opéra, conducted by Georges Sebastian. Released on DVD as La Callas... toujours (INA on EMI Classics, 2001). This video can be viewed on YouTube at http://www.youtube.com/watch?v=GLEFU3oeqtw. 20. Excerpt of Maria Callas singing Rossini's "Una voce poco fa" from Il barbiere di Siviglia the live Paris concert at the Palais Garnier (Théâtre National de l'Opéra), 19 December 1958, with the Orchestre et Choeurs du Théâtre National de l'Opéra, conducted by Georges Sebastian. Released on DVD as La Callas... toujours (INA on EMI Classics, 2001). Fig. 1. 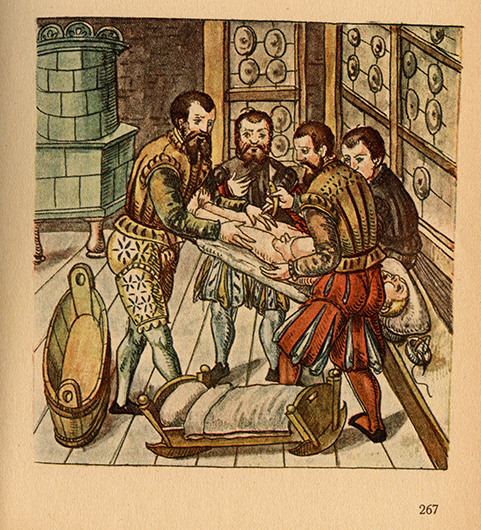 Image showing surgical preparation for testicular castration, from Caspar Stromayr's Practica copiosa, written in Lindau and completed in 1559, with caption that reads:, "Dise Figur ziagt gar Eben/ Wie die Kinder sein zu legen" (This figure shows exactly how to lay the children down.) The original is extant in Leipzig, Frankfurt am Main, at the Deutsche Nationalbibliothek. Reproduced from Die Handscrift des Schnitt- und Augenarztes Caspar Stromayr in Linden im Bodensee in der Lindauer Handscrift (P.I. 46) vom 4. Juli 1559, edited by Walter von Brunn (Berlin: Idra, 1925), plate 8 (p. 267). Fig. 2. Jacopo Amigoni. Farinelli crowned by Music (Euterpe), 1735. 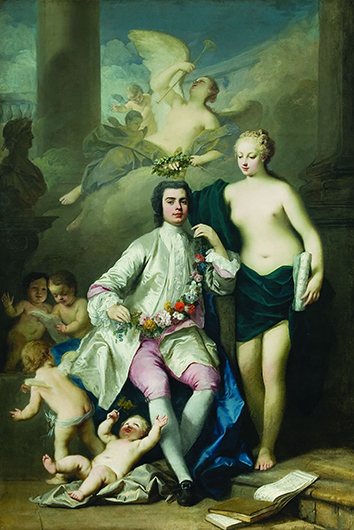 Amigoni suggests a mythological crowning at a moment when Farinelli was at the height of his vocal and representational powers and was still singing publicly in London. Oil on canvas. 277 x 186 cm. Muzeul National de Arta al României, Bucharest. Reproduced by permission. Fig. 9. 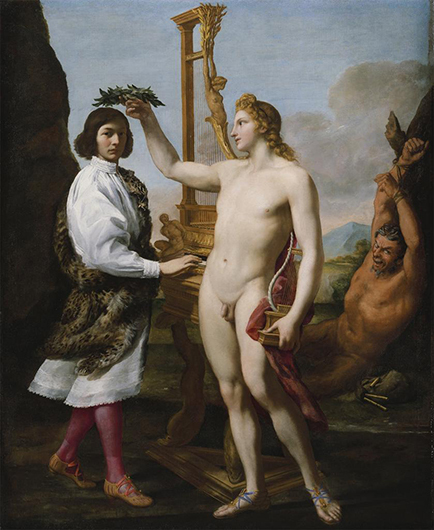 Andrea Sacchi, oil painting of Marc'Antonio Pasqualini (1614-91) being crowned by Apollo. 1641. Image courtesy of the Metropolitan Museum of Art, New York City. Purchase, Enid A. Haupt Gift and Gwynne Andrews Fund, 1981. Reproduced by permission. No. 16. 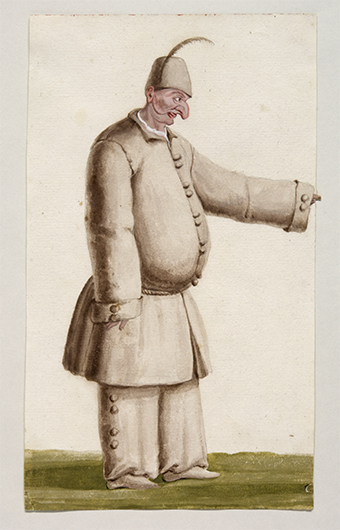 Lodovico Ottavio Burnacini (1636-1707), Pulcinella, watercolor, late seventeenth century. Österreichische Nationalbibliothek, Vienna. Reproduced by permission. Fig. 17. C. Lindstrom, Pulcinella cantastorie, shown singing outdoors in the Largo del Castello (now Palazzo del Municipio) in Naples, pen and ink, circa 1812. Collection Umbert Bowinkel, Naples. Reproduced by kind permission. Fig. 19. 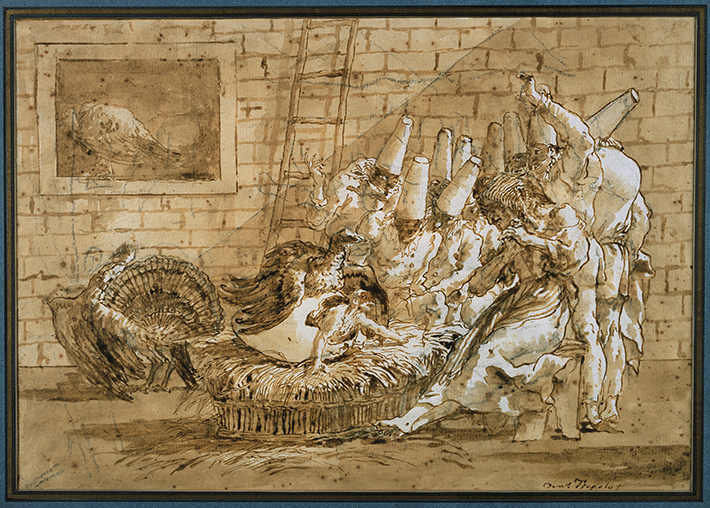 Giandomenico Tiepolo, drawing of Pulcinella hatching from the egg of a turkey, surrounded by Pulcinella figures. Sepia ink on paper, ca. late eighteenth century to 1800. Private collection, London. Photographic Survey, The Courtauld Institute of Art. Reproduced by permission. Fig. 20. 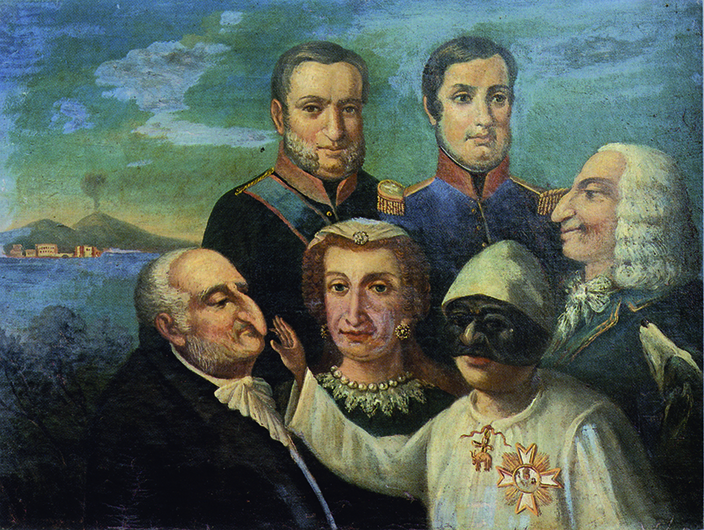 Pulcinella and the Bourbons, anonymous Neapolitan painting, first half of the nineteenth century. Private collection of Giuliana Gargiulo, Naples. Reproduced by kind permission. Fig. 31. 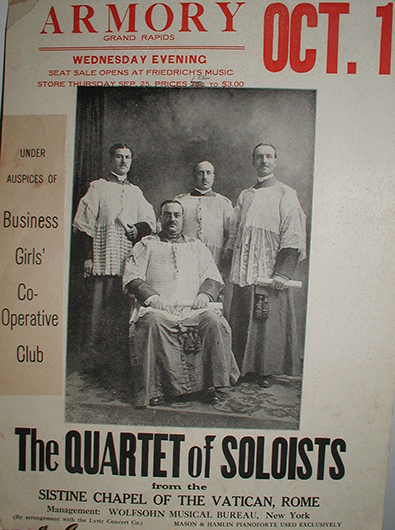 Poster announcing a performance by the Quartetto Vocale Romano Gabrielli-Gentili, Grand Rapids, Michigan, October 1, 1919. Presented by the Business Girls' Cooperative Club. Original print in the private collection of Luciano Luciani, Fiumicino (Rome), kindly made available by the collector. Fig. 32. Leonardo Marini, drawing of Maometto Gran Mogul (the Grand Mogul Mahomet), conceived at Turin for primo soprano castrato Giovanni Manzuoli, who played the role in Tamas Kouli-Kan (Turin, Regio Teatro, 1772). By permission from the Ministero dei Beni e delle Attività Culturali e del Turismo, Direzione Regionale per i Beni Culturali e Paesaggistici del Piemonte-Biblioteca Reale di Torino. Fig. 33. 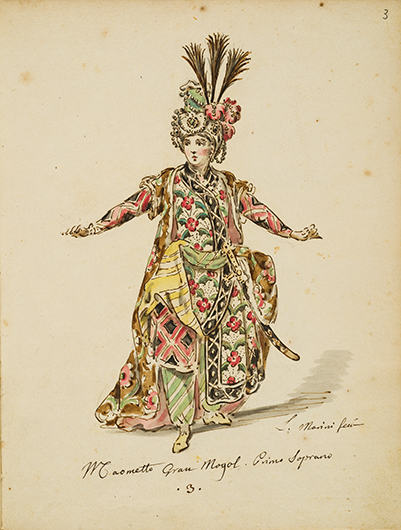 Portrait of Senesino by John Vanderbank showing the singer as Bertarido wearing a "Hungarian" costume in Handel's Rodelinda (King's Theatre, 1725), about to sing "Dove sei" in act 1, scene 6. A note on the back, written by its original owner James Harris (1746-1820), attests that the portrait was originally commissioned by Richard Willoughby, Esq. of Knoyle. 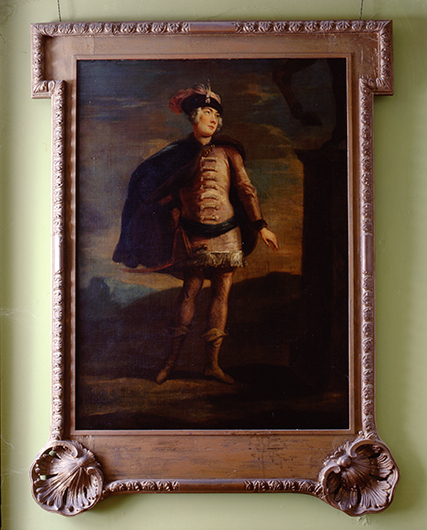 Collection of James Carleton Harris the 7th Earl of Malmesbury. Reproduced by kind permission. Fig. 34. 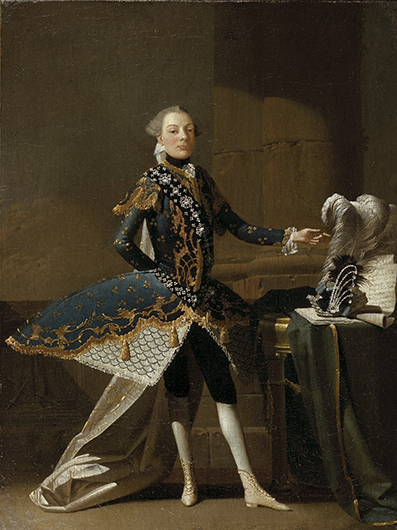 Charles Joseph Flipart, portrait of Carlo Scalzi (Signor "Sirbace"), who is given a decidedly royal expression and bearing as he points to his regalia, which in his case includes a theatrical crown with great ostrich plume and a sheet of music. 1737. Oil on canvas, 18 1/2 x 14 inches. Wadsworth Athenaeum Museum of Art, Hartford, CT. The Ella Gallup Sumner and Mary Catlin Sumner Collection Fund, 1938. No. 177. Reproduced by permission. Fig. 35. 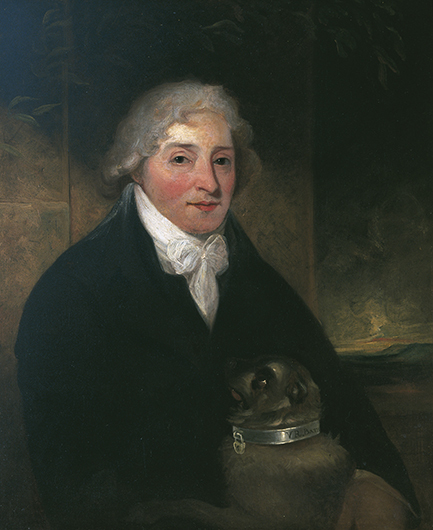 James Hutchinson, portrait of Venanzio Rauzzini with his dog Turk, ca. 1795. (c) Holbourne Museum of Art, Bath (A 169). Reproduced by permission. Fig. 52. 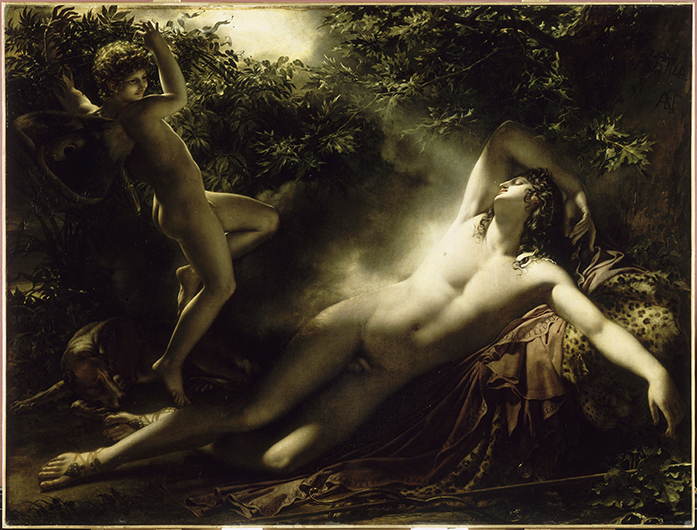 Anne-Louis Girodet de Roussy-Trioson (1767-1824), The Sleep of Endymion, 1793. The painting is mentioned in Balzac's Sarrasine, where it hangs fictitiously in the salon of the Lanty family and absorbs the attention of the narrator's female auditor. Nowadays it is housed in the Louvre in Paris. (c) RMN-Grand Palais/ Art Resource, New York. Reproduced by permission. Fig. 53. 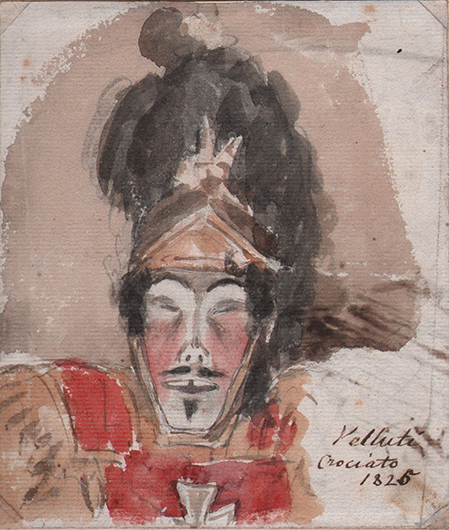 Alfred Edward Chalon, watercolor of Giambattista Velluti in Meyerbeer's Il crociato in Egitto (1825; given in London in 1826). Opera Rara Archive. Reproduced by permission.